This information was handed out to your child/children in class! More detailed information will be sent home and posted shortly!!! PLEASE NOTE THAT ALL INFORMATION WILL BE HANDED OUT, EMAILED AND POSTED!! If you haven't done so already, below is the link for our studio calendar (that is also located in the "Class" tab) for you to download and print! CONGRATULATIONS TO OUR PERFORMANCE DANCE COMPANIES THAT COMPETED THIS WEEKEND AT THE ROYAL DANCE COMPETITION!!! OUR STUDENTS TOOK HOME 3 FIRST PLACE OVERALLS, 1 THIRD PLACE AND 1 5TH PLACE OVERALL AS WELL AS 3 SPECIAL JUDGES AWARD AND THE STUDIO AWARD FOR TEAM SPIRIT!!!! ​Our 2-Day Dance Intensive was a great success!! Watch our students hard at work and leaving it all on the studio dance floor in our Video Gallery!! Studio closings due to weather will be made by 12 noon Monday through Friday – 9am on Saturdays. A message will be left on the answering machine as well as an email blast , website, Facebook and Instagram! ​Welcome! 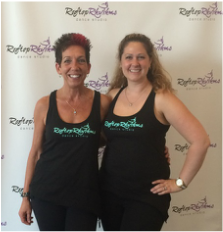 We are so excited to be starting our 18th season at Rooftop Rhythms Dance Studio!!! Here is where you will find all of the current news of the studio. We will be posting important events, school closings, and any other pertinent information you may need...or even just to share some good news!! Classes begin on Monday, September 24th, 2018! Our downloadable registration form can be found under the "Registration" tab. You may also download our brochure and student calendar found on the class schedule page!!! ﻿What's better than a Dance Birthday Party!! Come celebrate your child's birthday at our studio!!! Click Here to Sign up for Studio Emails!